weCHOOK | weChook Racing: 3galoo Design: What’s Different, What’s the Same? weChook Racing: 3galoo Design: What’s Different, What’s the Same? As we came to the decision to build a new car for the 2016 season, the first question was ‘What do we keep the same, and what do we change from 2Galoo?’. There was an easy answer for this when we started designing and building 2Galoo: Change everything! Boogaloo was huge, bendy, impossible to drive in the pit lane and slow. Only two things made it intact from our first to second cars – the layshaft gearing system, and the electrical system (and even that was directly carried over from C-XeVolution / Project-E). So change everything we did! In order to reduce our aerodynamic profile we lowered the driver’s seating position, cambered the wheels and replaced the steering wheel with a lever – all in all reducing our frontal area by more than 30%. To increase stiffness we replaced the steel space frame / plywood construction with a tub made from Rohacell (with the added benefit of a ~4kg weight saving).The steering was redesigned from scratch, using trail rather than caster to maintain high speed stability, without the awful dry steering – it mostly went to plan apart from breaking at half the races 2galoo attended. All in all, I’d say it worked! 2galoo competed in the second half of the 2015 season, achieving 2 podiums and finishing in 8th place in the final championship standings. 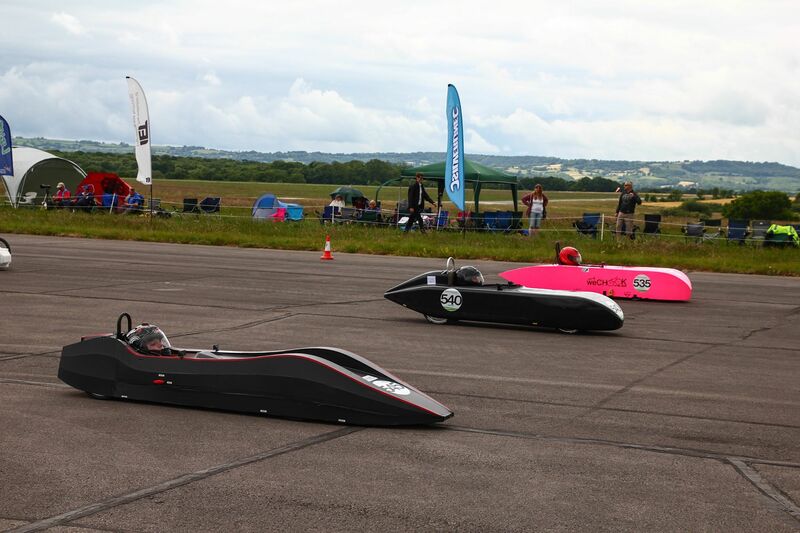 Ahead of us were a car each from JLR and Renishaw, two cars from Silesian University (regular corporate challenge winners), Rotary Racer (many times F24 champion) and Jet (2013 and 2014 F24+ champion). Bodywork – In both form and surface quality 2galoo lagged far behind the cars that finished the season ahead of it. Wheels – Most of the cars that were ahead of us had created a flat wheel in one way or another, meaning it wouldn’t have to be trued, and that the total width of the car could be reduced. Also, Renishaw were using lower diameter wheels than we had used, allowing the whole car to be shorter in height, and therefore have a lower frontal area. Based on this, and having carefully inspected the new wheels on Jet 2, we decided to start with smaller, flatter wheels. This decision drove changes along the rest of the car, meaning we could make the chassis shorter in both height and length, and reducing overall width of the car. It also buys a precious extra cm of width for Ian’s knees, the discomfort of which is his biggest gripe with 2galoo. Smaller wheels also force a change to the gearing, as they effectively act as a different final drive ratio. In the next post I’ll go into the design iterations we’ve gone through with the wheels, and our final intended design. Nice article Matt. Useful insight into your development programme. Looking forward to reading the next instalment and seeing the car on track.